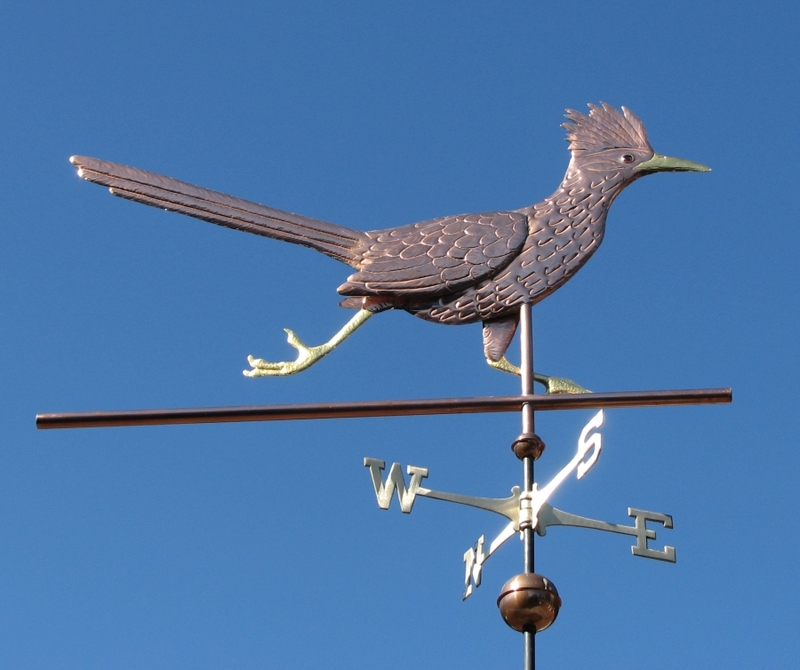 The Roadrunner Weather Vane, Geococcyx californianus, is one of our earliest designs. Some of the first art shows we did were in the Scottsdale, Arizona area. As one would expect, the roadrunner weathervane is a very popular design in the desert areas of the American Southwest. It is also a popular logo for many sports teams due to its speed and agility. A number of our weathervanes are regional in their appeal. Coyote, Jackrabbits, Hawks, Bats and Gambel’s Quail Weathervanes appeal to our customers in desert and semi-arid areas. Likewise, when we did art shows in the Northwest, our Bald Eagle Weathervanes, Orca Weathervanes and Salmon and Trout Weathervanes proved popular. In Florida, Manatee, Alligator and Dolphin Weathervanes were the big hits. The Roadrunner shown here is an extra-large (4-foot size sculpture piece). 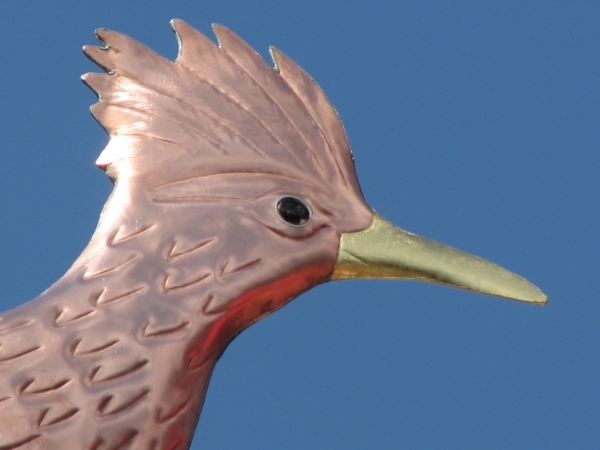 This roadrunner was crafted in copper, and has brown glass eyes with black pupils. We added optional gold leaf to the beak and legs. It was installed on a new 50-foot bell tower at an elementary school in Houston, Texas. The roadrunner is the school’s mascot. Many of our roadrunner weathervanes have been made in the small (1-foot sized sculpture piece) and medium (2-foot sized sculpture piece) sizes. The small weathervanes can be displayed on a deck railing, in a patio or on top of a small garden shed. 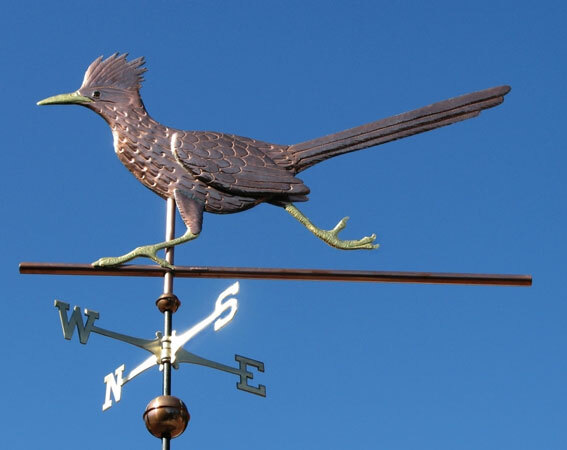 The medium size roadrunner weathervane is perfect in a garden or on top of a garage or single story home up to around 2,000 square feet in size. The Roadrunner is one of two bird species in the genus Geococcyx, of the cuckoo family, Cuculidae, native to North and Central America and featured in stories and legends across many cultures. In Southwest Indian legends, roadrunners are usually notable for their speed (despite their small size, roadrunners can run faster than humans), bravery (roadrunners kill and eat rattlesnakes), and endurance. The Hopi and other Pueblo tribes believed that roadrunners were medicine birds and could protect against evil spirits. Stylized roadrunner tracks have been found in the rock art of ancestral Southwestern tribes like the Anasazi and Mogollon cultures, as well. And, of course, who could forget Wile E. Coyote of Looney Tunes fame.